When we arrived at Adare for our second round of the trip, the first request made in the pro shop was for a mobile phone recharger. One was produced immediately. Nice touch – keep the customer happy. Rod and I were delighted – yer man, Ronan, had been using our phones since the previous day. 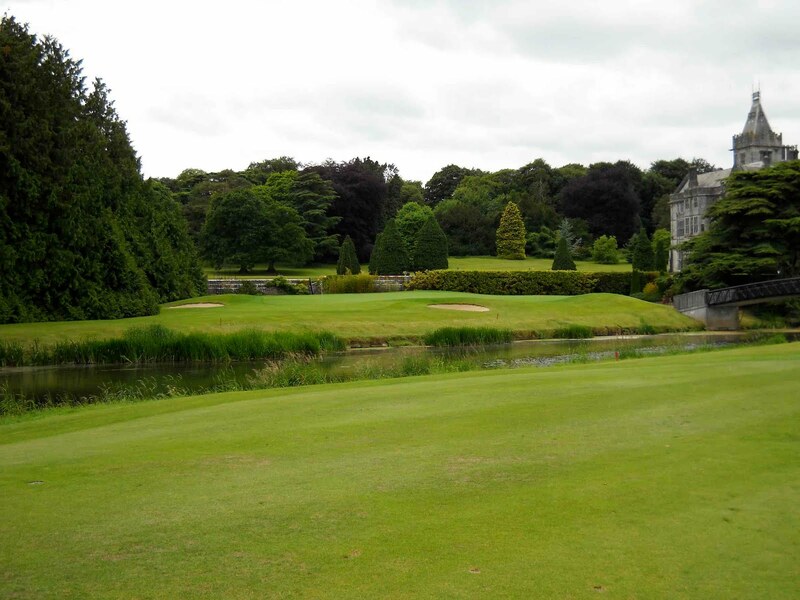 Adare was preparing for the JP McManus Pro-Am (5 & 6 July) and a huge marquee was being erected near the clubhouse. The place looked superb and as there was no surly security guard this time, I started in much better spirits than my last visit (rain, puncture, obstructive guard). A great breakfast (highly recommended) and a leisurely wander around the pro shop were just what we needed, and the young lad in the shop told me that 12 of the world’s top 15 players were playing in the event (no Mickelson, Kim or Stricker). The confirmation, three days before, that Tiger was playing had boosted interest hugely, so I wasn’t that surprised to hear they had a full time sheet. Adare is one of those grand venues, with a long drive up to an elegant clubhouse (not to mention the 19th century hotel and former residence of the Earl of Dunraven), excellent facilities and a relaxed air that matches Mount Juliet. It puts you in a great mood. 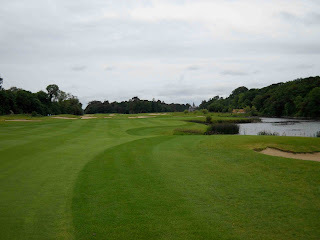 I’d also wanted to play Adare rather than another links course so that we could savour the differences between a top links and the best parkland in the country. It started well, too, as three drives found the fairway, but after that balls ended up in the water a bit too often. We played skins, 20c a skin, and I had eight skins after eight. After that, nothing could ruin my day. Ronan, as is his way, had a late surge that pulled in two birdies and a back 9 of two over. The second birdie came on the famous 18th where he was able to have a go for the green in two, over the River Maigue. 511 yards with all carry to the green makes for two fine blows. Rod’s golf was up and down, literally, as he dug his way out of the rough and bunkers to make several elegant pars. In ‘Hooked’ I made two observations about Adare that I should revisit. The first comment was that the bunkers are too firm. When I read my review before this trip I thought I had made a harsh judgement, but the bunkers are hard. There is a fine layer of soft sand on top and then firmness underneath that can bounce the club. 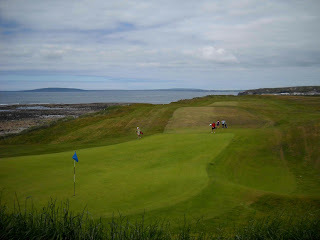 On this visit there was no rain to soak the soft sand and playing out of the bunkers was a pleasure – you get more check. This is the way Adare likes its bunkers, evidently, and that’s fine with me. My second comment was that Adare was tough. If you play badly, almost any course is tough, but I remember Adare having much tighter fairways and trees that squeeze you a lot more (at the start and on the back 9). 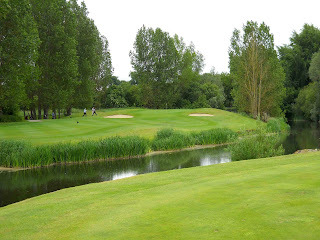 This time I was playing some of the best golf I’ve ever played and realised that sensible placing of the ball makes all the difference – yes, I know, that’s true of any course, but with trees and water crowding your line it’s not as obvious at Adare, where you are tempted to force it. It is big and spacious; the design and routing flow easily and, apart from one open stretch (holes 5 to 8), there is a denseness that makes the holes solitary and beautiful. There is a considerable debate about the best parkland in Ireland. 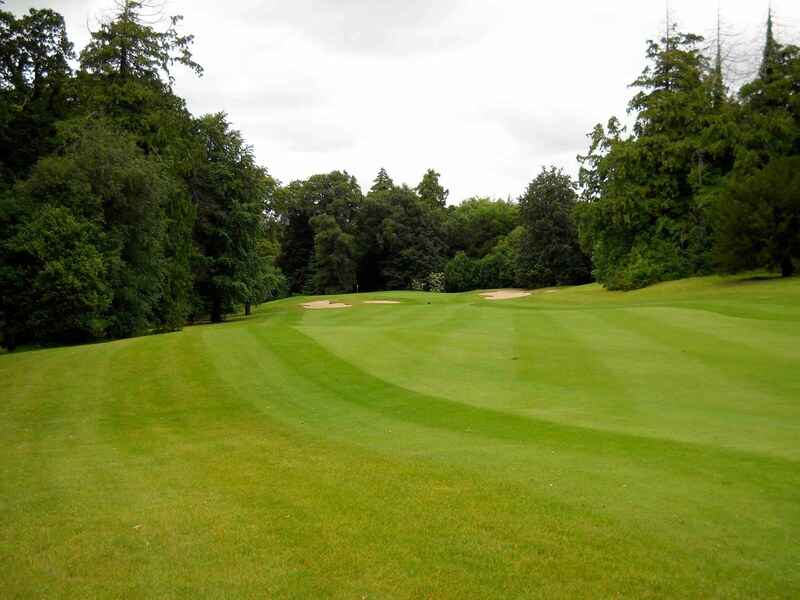 K Club, Mount Juliet and Adare are usually mentioned, alongside Druid’s Glen, Fota Island and Slieve Russell. Then there are the new pretenders: Concra Wood, Killeen Castle and Lough Erne. The oldest of them all is Carlow, so there is plenty of choice. I put three courses at the top of my list: Mount Juliet for hospitality, Druid’s Glen for dynamism, and Adare for scale and beauty. I suspect that Concra Wood and Lough Erne will be challenging that top three very soon, but for now I’m content to say that I played the best parkland in Ireland last week, and one of my top three favourite links (Ballybunion). 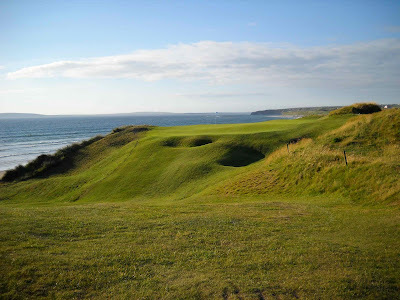 Not bad going when you consider that Ballybunion was free (a fourball voucher), Adare was 50 euro a head (thanks to the lovely Orla), the accommodation was free and Ronan refused to accept any petrol money – so just food, drink and crisps (not strictly a ‘food’ group). And poker money of course. The only negative is the size of the changing rooms, which are too cramped and dark after the expansiveness you get to enjoy everywhere else. But seriously, after a course this good, who cares! Labels: "JP McManus Pro-Am" "Adare Golf"
When we’d first arrived at Ballybunion, I took Rod and Ronan up to the left of the clubhouse to show them some of the holes on Ballybunion’s second and much younger course - the Cashen. I mentioned what a stunning back nine it is, never thinking we’d have the chance to play it. 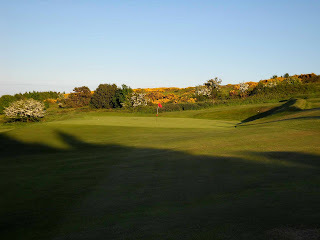 But Vari, said we were very welcome to play it after we’d finished on the Old course. As we sat in the bar after the first 18 holes, the evening was so perfect that it would have been irresponsible not to have accepted her generous offer. It was approaching 6pm and, as it had been for my first trip around the back nine of the Cashen course in 2008, so it was again: the sunlight made giants out of the mountainous dunes, their shadows stretching across the fairways, wrapping around our feet and pulling us onwards. The grasses burned gold and looked good enough to sleep on. See the photos and tell me I’m wrong. 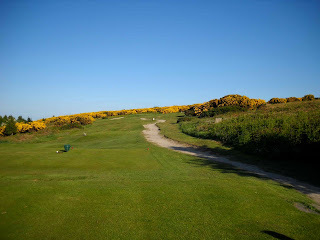 For those of you who don’t know the Cashen course, it is an interesting beast. It was designed by American, Robert Trent Jones Senior (although he was born in England, so perhaps there was the faintest hint of links in his blood), and it is a divisive course. From tee to fairway, it is links golf. From fairway to green, it is not… it is target golf. In other words, you have to land the ball on the green because there are few opportunities to bump and run the ball up severe slopes to greens. On a windy day that can prove nigh on impossible and not all links purists are emphatic in their praise. But I have two things to say about that: I love a challenge and it is such a beautiful setting that it needs to be appreciated for its unique design and the excitement it delivers - hole after hole. Ronan’s golf was getting better by the hole, but his long drives were getting him into all sorts of trouble because he was getting too close to the greens. 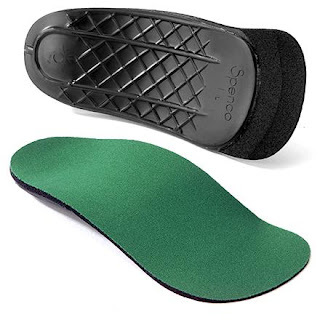 When you can bump and run that’s not such an issue, but delicate sand wedges are not the best option to seriously difficult and hard greens. It didn’t seem to matter – he was practically drooling over the holes. I think he preferred it to the Old. Rod was more phlegmatic and was enjoying nine holes that were completely different to those he’d played earlier. Me? I love both courses equally and I’d play them again and again. 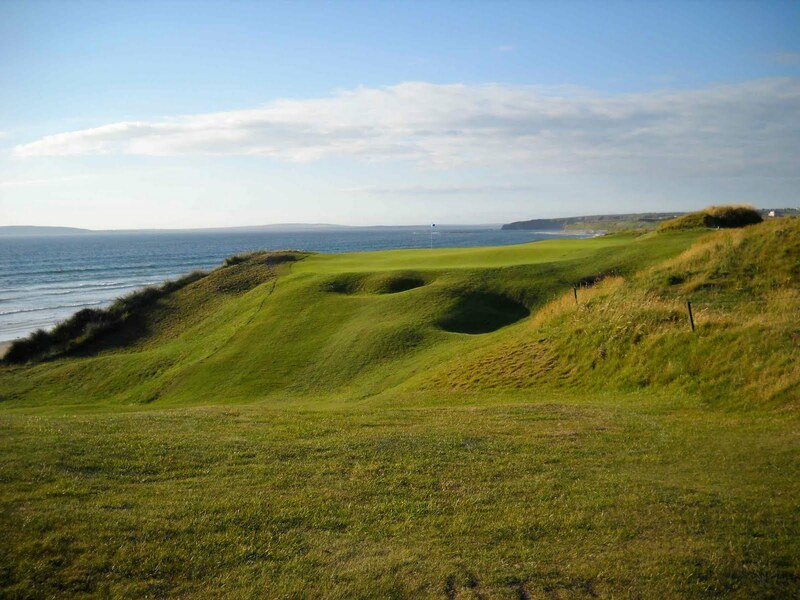 The setting is perfect, the dunes enormous, the history rich, and the challenges complicated and varied – when you see your ball on the fairway it is not just a sense of achievement you feel, it is uplifting too. The closing stretch is utterly superb. 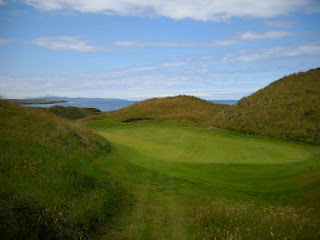 After a short and innocuous drive on the par five 15th – when I finally convinced Ronan to put the driver back in the bag – the hole doglegs sharply to the right after some 220 yards, drops down into a hollow and then races low between the dunes, all the way to a precariously perched green. 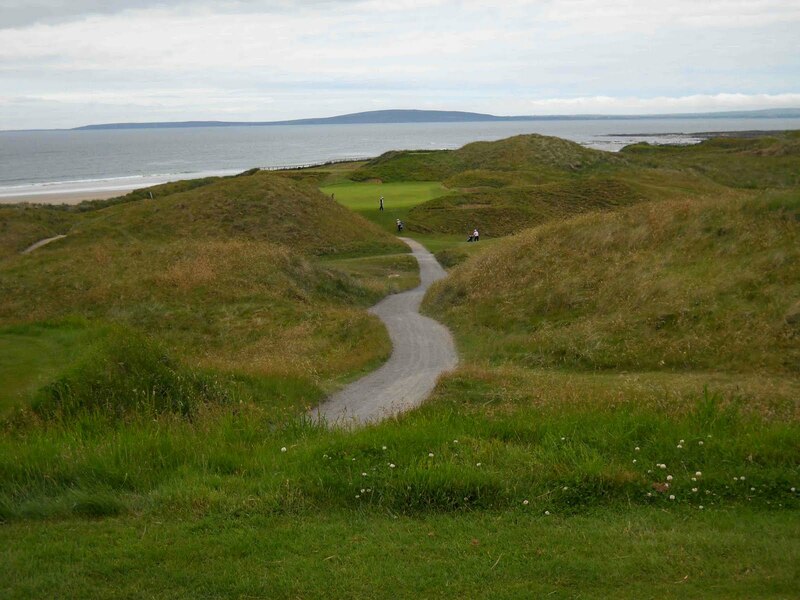 16 is a par three that drops to a green above the beach, while 17 is a par five that curls around the dunes above the beach and has one of the toughest approach shots in golf (severe drops to the sea) - especially if you plan to go for it in two. Ronan had been struggling with sore feet and played much of the 18th barefoot after the heels of his shoes had rubbed his flesh raw. Perhaps those extra nine holes were a walk too far, but he seemed so enthralled by what the Cashen had to offer that he wasn’t fussed. We packed up the bags, had showers and then ate in the clubhouse with the first round of the US Open playing above our heads. Great food, great company and amazing golf. You couldn’t ask for more, especially as we watched Padraig roll in a birdie putt on 18 before we left. 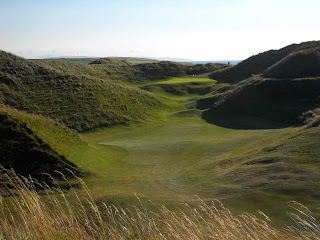 Labels: "Ballybunion Cashen" "Robert Trent Jones"
There are certain things that tug at the heart strings: a song, an ocean, an ex-girlfriend, a dinner your mother used to make. Everyone has a weakness. When it comes to golf, I imagine every golfer has such a weakness – either a course they’ve played (and probably scored 48 points) or a course they’ve dreamed of. Ballybunion is my weakness (or one of them at least), and I got to scratch that particular itch recently when a friend invited me down. Since we were going all that way, I arranged for us to play at Adare as well, as it is my favourite parkland (alongside Druid’s Glen). There were four of us to start, but one had to drop out last minute. That left Ronan, Rod and me, trekking down to Listowel in Ronan’s car on a perfect Wednesday evening. As per a perfect boys getaway, our ‘food’ supplies consisted of beer and crisps (Rancheros specifically). In a brief nod to healthiness I brought carrots and celery for the houmous. 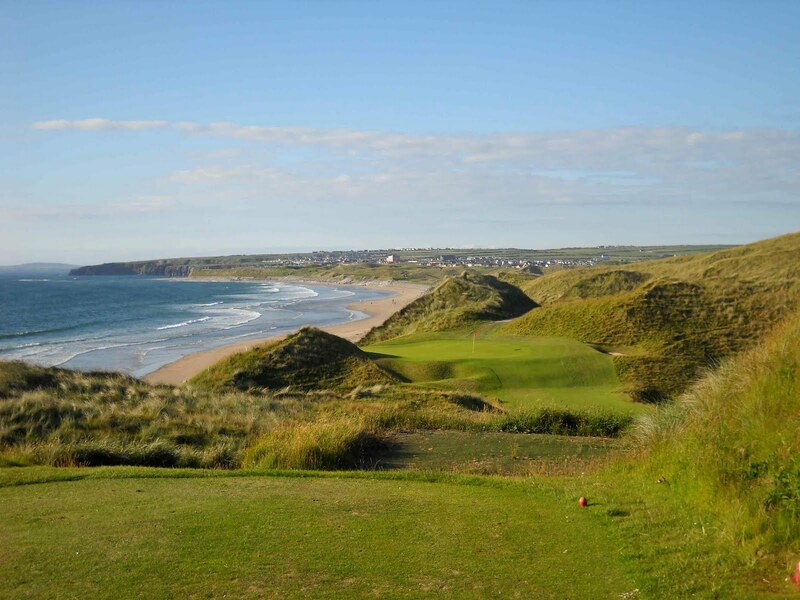 Thursday morning was perfect too – it helped that I’d won all the poker money – and we arrived at a sunny Ballybunion before 11am, for a 13.18pm tee time. Nothing quite like soaking up the atmosphere. I stuck my head into the office to say hello to Simon, the General Manager, only to find he’d left shortly after my visit in 2008, heading to ‘greener’ pastures in Dubai. Now it’s Vari McCreevy – ‘no relation of Michelle at Failte Ireland?’ I enquired. Sister, it turned out. ‘Are you as good a golfer?’ I continued. ‘Better,’ she replied. You’ve got to love that sibling rivalry. Imagine what the Maguire twins must be like! Ronan discovered he’d left a couple of clubs at the house and headed back to collect them, leaving Rod and me to enjoy the practice facilities. We chipped and putted for an hour, and while I have always appreciated the value of practice, on this particular day it was telling. As the high and low handicappers, Rod and I took on Ronan and Evan (who came up from Killorglin) and we gave them a good thumping: 2 up on the front, 1 on the back (after three late birdies from the opposition). Combined, Rod and I had 44 points, and Rod made a mockery of his 17 handicap, rolling in 8 pars. I put my good play down to the love of the course. Sometimes you just feel right when you step onto the 1st tee. A light breeze in your face, the sun splitting the clouds, good friends and the fact that you’re playing for free (Ronan had a fourball voucher) all come together to lift your spirit. And then you split the fairway. What could be better? What worked so well about the day was a list of shots that any pro would be happy with: on the 3rd, from off the green, Ronan tickled a six iron up a bank, across the shoulder of a bunker and onto the green where it broke towards the hole and resulted in a par; Evan hit an even more delicate shot on the 9th, over a rugged bank and onto a green that was hard to hold from any direction; and Rod just kept knocking in putts for par, halving and winning holes from everywhere. There were plenty more too, including three eagle opportunities. Like any great links, your ball will be tossed about at Ballybunion, and after the 5th hole the greens become increasingly difficult. The 6th (after a brief stop at the halfway house where we met a mother and daughter suitably red and roasted – sun screen doesn’t rank high on the list round here) doglegs out to the sea and has steep fall-offs that will break your heart if you’re a fraction off target. The 7th and 9th are also brutes. Missing them in any direction makes getting up and down nigh on impossible for ordinary golfers, and if you’re unlucky enough to hit the downslope you’ll probably be in thick, impenetrable rough. We had expected (and been told) that a five hour round was on the cards. The course was busy (over 3,000 euro in green fees) and we were held up from time to time, so it was impressive to step off the course after four hours. These days there’s an expectation that it will take you five hours to get around the big, popular-with-American courses, so this was a rare treat. A three-ball behind us – complete with caddy/wife – remained patient all day. And no sooner were we off greens than balls came zipping in at the flags. We didn’t see much bump-and-run, but when you can stop a ball as quickly as these guys could, why bother. The 18th tee sits up high above the beach, with the 17th green immediately in front of you. As we waited to drive we watched the three guys approach. The flag was tucked tight to the left, behind a bunker, and all three shots landed next to the pin and stopped. Two of our group who had tried the ground route ran off the back of the green. Not fair - this is links, damn it! In the bar we discovered that the three ball was made up of JD Guiney, back from Orlando where he’s on a golf scholarship; John Fitzell who plays off 3, and went round in 2 over; and Peter Masters, the writer for Golf World who was over reviewing a few courses (Doonbeg, Ballybunion and Portmarnock Links). He plays off 9, but looked like he was comfortably matching his playing partners. It was interesting meeting a golf writer who was reviewing a course. I got the impression from his comments that he preferred Doonbeg to Ballybunion. It will be intriguing to read his reviews in the magazine to see how he compares the two. I chatted to them for a few minutes, heard a few interesting Kerry expressions (unrepeatable on here), and then had to leave as three of us (minus Evan who had headed home) headed out the door to play nine holes on the Cashen course. 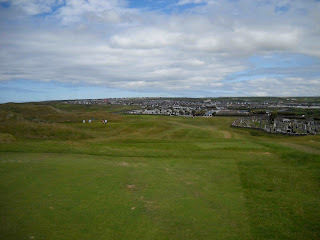 Ballybunion Old is a glorious track. It is packed with so many memorable moments: views from the 2nd green, tee shots on 11, 13, 15, 16 and 17, and the dunes that turn the back nine into a mountainous affair. You have choices all over the place: on tee shots, approaches and around the green. It’s about using your head, trusting your swing (and club selection) and putting with confidence. Grip it and rip it by all means (the par five 13th turned into a drive and 8 iron for Ronan, and he then drove clear over the boundary of the course and onto the beach on 17), but a well steered iron will serve you just as well. Remember that when you stand on the 1st tee and glance nervously at the cemetery alongside the fairway. It is a pertinent reminder of what can happen to your ball if you are over-exuberant. I have been asked a few times why I didn’t include Ireland's 9 hole courses in 'Hooked' - especially as there are so many great 9 hole tracks. Cruit Island, Borris, Helen's Bay spring to mind but there are many more. And let's not forget that there are some truly awful 18 hole courses out there that should be turned back into the farmland from whence they came. On my travels I drove past several 9 holers and I was sorely tempted, but I was always on my way to another course - perhaps I shouldn't have let that stop me. 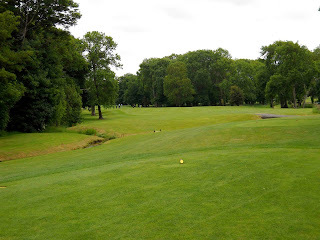 One such course is Carrickmines - a place I played a fair bit during my youth as a friend of mine is a member there. It sits on a hillside on the outskirts of Dublin. I hated the place. 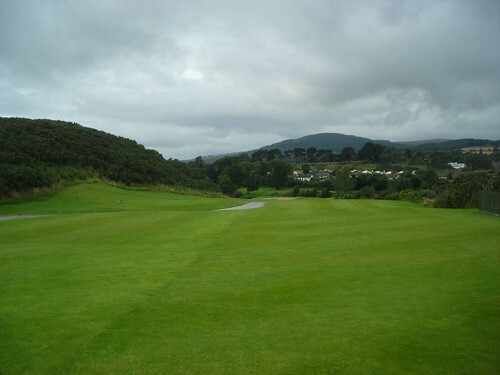 Unfair bounces, sloped fairways, fast greens, gorse and deep rough, together with some quirky green settings, made Carrickmines a disastrous score waiting to happen. Charlie kept asking me to play and I kept finding excuses. Finally, I had to play the course in a competition. 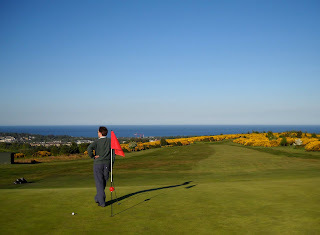 All those reasons that I hated the course came flooding back - only now when I played it, I loved it for those very same reasons. 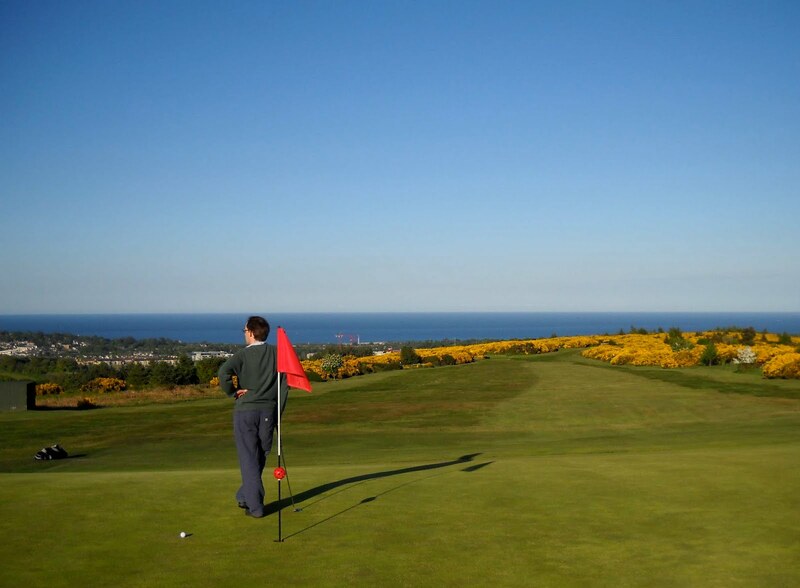 You need to play it with guile, and the fact that it's 9 holes means that by the time you play the 'second' 9, you'll have learned a few things about the slopes and the greens. And there's a lot to learn. It is a short course - par 69 and 6,000 yards - but it has 18 tee boxes which adds variety and length: the 9th is a par four the first time around, but a par five as the 18th. 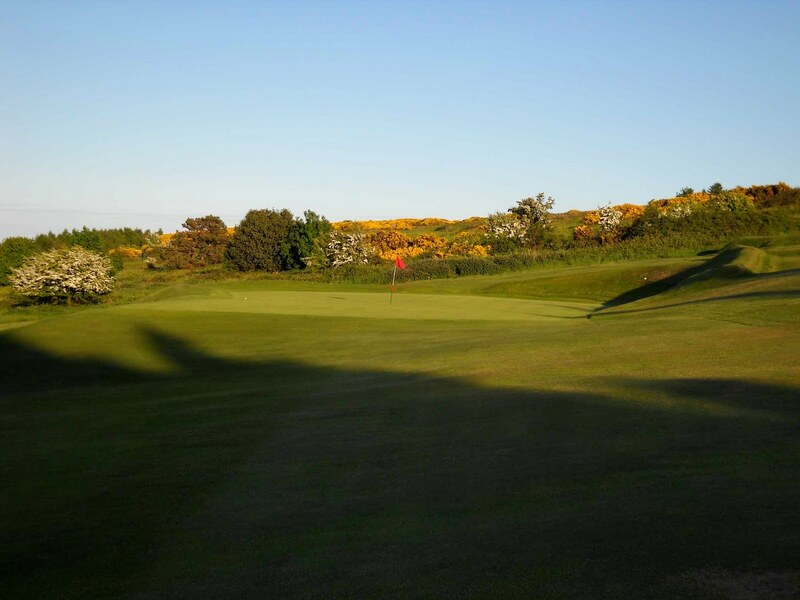 The last few times I've played it the condition was excellent and the greens are the most natural you'll find - things of beauty and deceivingly fast. You'd describe it as heathland, but during the winter it plays like a links, and the links tactic of bump and run will serve you well here all year round - even on the par three 4th/13th. 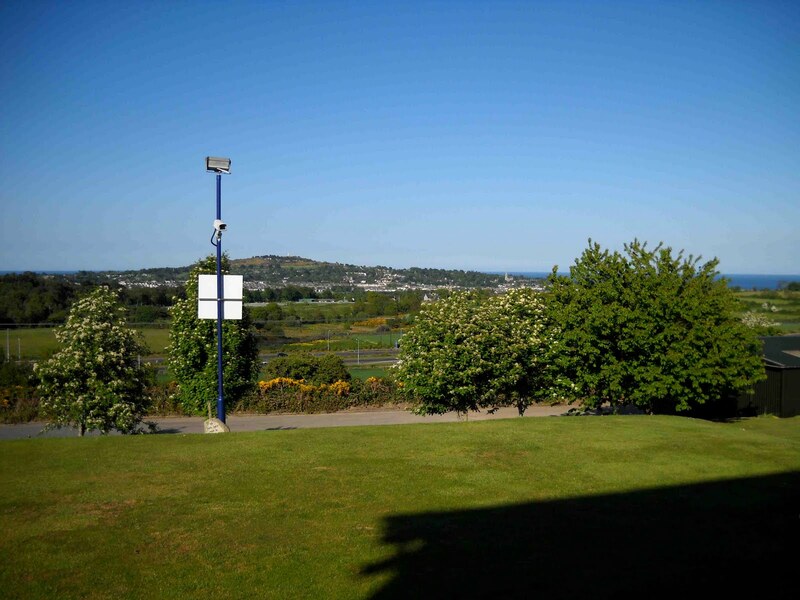 The M50 now races below the course, and if you look up the hillside as you pass the Kilternan exit, you'll catch glimpses of the course and golfers stamping about. There are still views over to Killiney Hill and the sea beyond, but that gash of cement, tar and ant-like cars draws the eye more than it should.